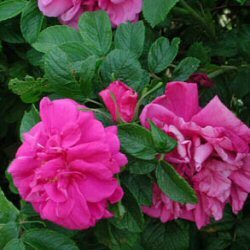 A very popular hedging rose, the Apple or Ramanas Rose (Rosa rugosa) is a quick-growing, hedging species, putting on between 30cm (1ft) and 60cm (2ft) of height growth each year. A non-evergreen rose and distinguished by its prominent, appealing large, reddish-orange hips which form in summer and last well into winter. Delicate single mauve coloured flowers, which are very fragrant , keep forming throughout summer. Planted with the white flowered Apple Rose, the two colours fully compliment one another. The branches of an Apple Rose are covered in masses of small prickly thorns, hence its attraction in forming an impenetrable barrier. Our Apple Rose hedging trees are sold as plug plants, in other words the roots are encased in compost. This means that planting can be carried out at any time of the year, provided they are watered in periods of drought, compared to bare-root plants which can only be planted during the plants normal dormant period (November to March). All of these trees are UK grown, which is important for successful establishment. How many Apple Rose hedging trees do I need? We recommend planting 6 plants per metre using the double staggered hedge method. October 2013: Dear Alan, Our tree arrived beautifully packed and in perfect condition . Planted the same day it has grown several inches already and is looking gorgeous – adding a certain elegance to our garden. The same applies to the Rosa Rugosa now planted happily in my mother’s garden – as always the best of service and the best plants. Many thanks Dee Daunter . White flowered apple rose (Rosa rugosa alba) is grown from seed collected from white-flowering apple rose bushes. Even though we do this, sometimes the resulting apple rose flowers may be a mixture of white and pink flowers. This is entirely unpredictable and the reason for this is genetic as one of the parent bushes for white flowering apple rose is the pink flowering apple rose. We at trees-online are not therefore not liable should a mixture of flower colours appear.